In order to get some scripting practice in for something relatively easy and productive, I want to add some new subraces. They must be canon (No, we're not adding in wereoozes). They MUST come with stats from a source book, preferably with a link. They must be somewhat suitable for a city adventure setting (aka: please no trolls, ogres, or clearly monstrous races that no self-respecting city guard will let into the city). These might be appropriate for v6, but I'd rather script them for v6, if it makes sense. Don't comment on each others posts or I'll delete them. Yes, I am aware that lycans are a priority and in theory, I could indeed release them to the public with a simple appearance change, but we want to do these races 'right' and not half-assed, and sadly it takes someone with more talent than me. As was requested in Discord, the Goliath. • +4 Strength, –2 Dexterity, +2 Constitution: Goliaths are massively muscled, but their bulk sometimes gets in the way when they’re trying to be nimble. • Goliath base land speed is 30 feet. • Medium: As Medium creatures, goliaths have no special bonuses or penalties due to their size. However, see the powerful build ability description below for more details. • Monstrous Humanoid: As monstrous humanoids, goliaths are proficient with all simple weapons, but they have no proficiency with any armor or shield. • Powerful Build: The physical stature of a goliath lets him function in many ways as if he were one size category larger. Whenever a goliath is subject to a size modifier or special size modifier for an opposed check (such as during grapple checks, bull rush attempts, and trip attempts), the goliath is treated as one size larger if doing so is advantageous to him. A goliath is also considered to be one size larger when determining whether a creature’s special attacks based on size (such as improved grab or swallow whole) can affect him. A goliath can use weapons designed for a creature one size larger without penalty. However, his space and reach remain those of a creature of his actual size. The benefits of this racial trait stack with the effects of powers, abilities, and spells that change the subject’s size category. • Mountain Movement: Because goliaths practically live on the ledges and cliffs of the most forbidding mountains, they are particularly adept at negotiating mountain hazards. Goliaths can make standing long jumps and high jumps as if they were running long jumps and high jumps. A goliath can engage in accelerated climbing (climbing half his speed as a move action) without taking the –5 penalty on the Climb check. • Acclimated: Goliaths are automatically acclimated to life at high altitude. They don’t take the penalties for altitude described in the Mountain Travel section on page 90 of the Dungeon Master’s Guide. Unlike other denizens of the mountains, goliaths don’t lose their acclimation to high altitude even if they spend a long time at a lower elevation. • +2 bonus on Sense Motive checks: When speaking to one another, goliaths tend to augment their verbal communication with subtle body language. They are likewise able to “read” the unintentional body language of others. • Automatic Languages: Common and Gol-Kaa. Bonus Languages: Dwarven, Giant, Gnoll, Terran. • Favored Class: Barbarian. 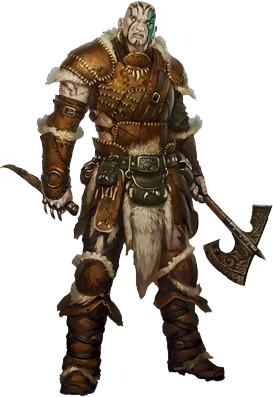 A multiclass goliath’s barbarian class does not count when determining whether he takes an experience point penalty (see the XP for Multiclass Characters section, page 60 of the Player’s Handbook). The tribal life of the goliaths produces many barbarians. Provide me a hybrid form, MrPenguin. They're still technically medium. I think you could just base the race on the half-orc body with different heads or something and go from there. I think you're right no need to waive a cool race off because of wysiwyg. Goliaths are massive. They average between 7 and 8 feet tall (2.1 to 2.4 meters), making them even taller than dragonborn and half-orcs. Goliaths have noticeably bony or prominent supraorbital ridges above their eyes. Goliath eyes are often a bright blue or green and sometimes glow a little. Goliath skin is often gray or brown and is extremely tough (often compared to stone). One of the most distinctive features of the goliath is the darker (often vertically symmetrical) patches of skin that cover their entire bodies. Goliaths believe that these markings somehow explain or controll their fate or destiny. For this reason, goliaths never tattoo themselves as this could affect their future. Goliath skin is littered with bony growths called "lithoderms". These growths are roughly the size of a coin and appear like studded pebbles on their arms, shoulders, torso or head. Edit: Again, Moosh why do you always beat me to the punch lol. Synads seem unsocial to the naive. In truth, each synad is a group unto himself, composed of three fully independant minds that are fused into a cooperating whole. While most races suffer the crushing loneliness of a wholly closed-off mind, synads reap the benefits of combined thought, cooperative planning, and multiple viewpoints on each new task or topic. I posted the Goliaths for the others that wanted it, my personal request would be some kind of Half-Golem! Cannot run, cannot wear armor, and would be an interesting opposition to the warforged. Humans whose souls are trapped in completely metal bodies, vs someone experimented on and turned into something not quite human but not quite warforged. They've come to Arabel in the hope of maybe finally finding acceptance, and someone to help them. Kenku. The unnoticed parasites of large cities. Because damnit I've been waiting since v3 to play my Goblin Paladin. Spiff could flex that creative wing-wong of his and flush it out a bit, tune it to the Arabel server rather easily. Bastian Morrow's brood, he came through for us after-all.